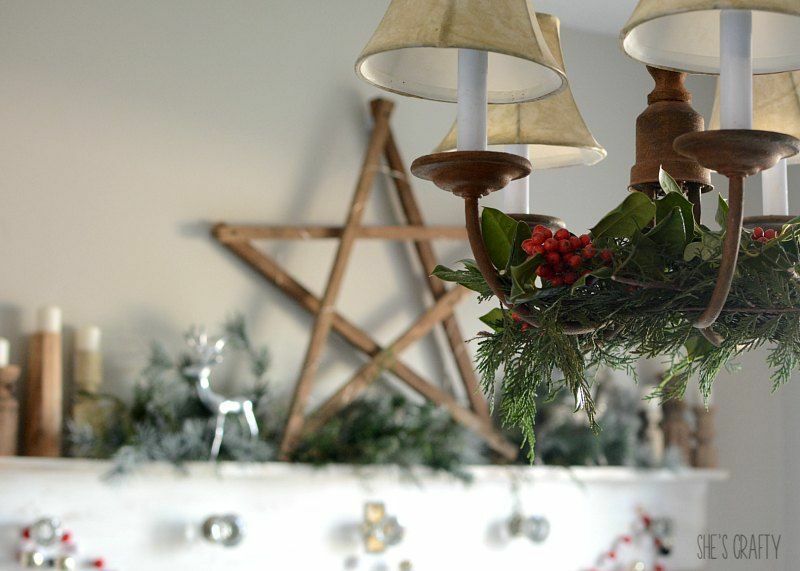 I'm back to share part 2 of my Christmas Home tour! 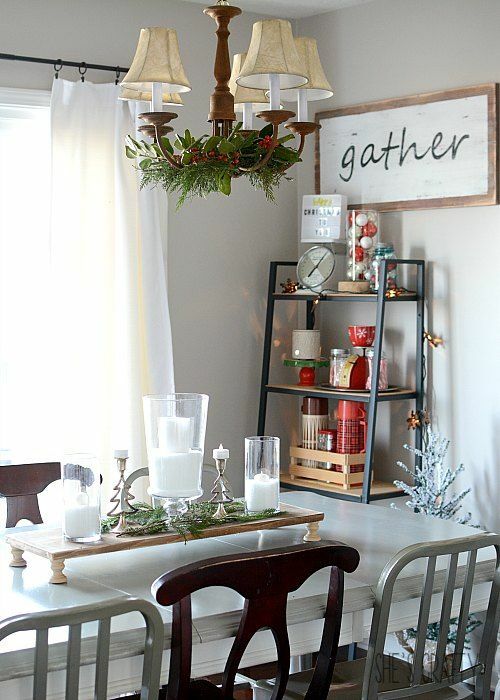 We'll start in our dining room. 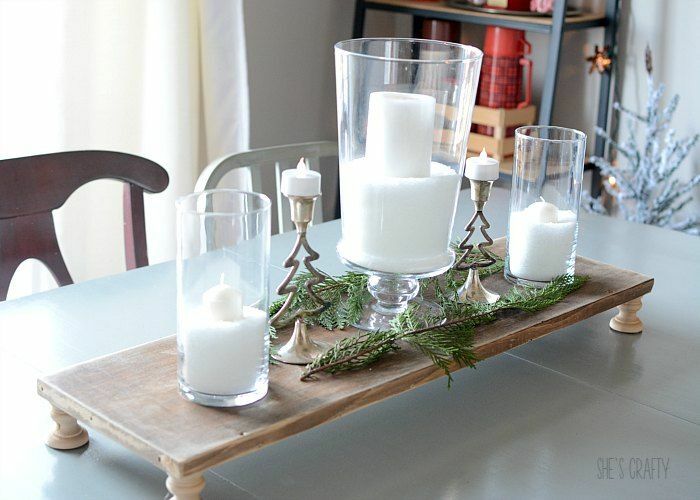 and some candlesticks from Hobby Lobby. On top I put some candle jars. The "snow" is epsom salt. 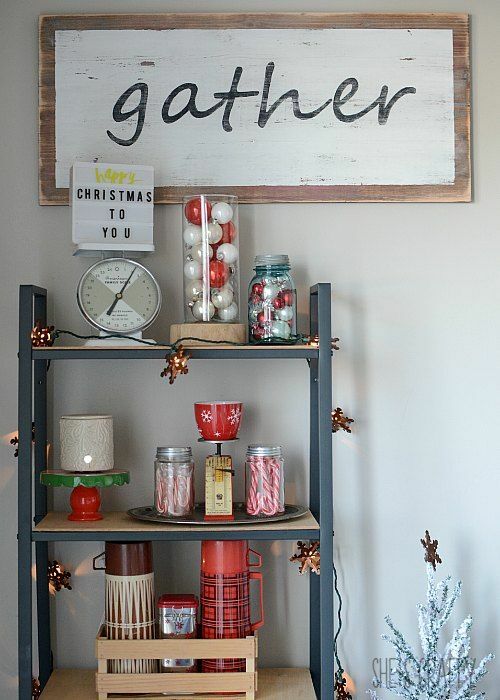 This is my Christmas Mantel. some candlesticks, reclaimed from old spindles and some deer. 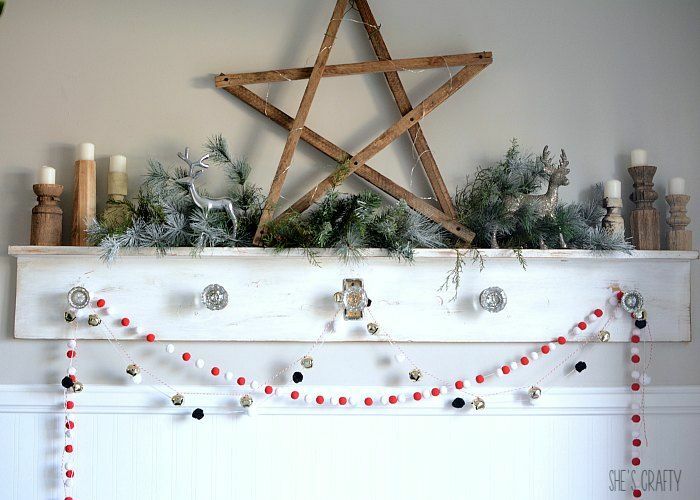 a jingle bell garland and a DIY black and white pom pom garland. Even the light fixture got a few fresh greens. the gray cupboard here, it left this space empty. So I moved in a little IKEA bookcase I've had for many years. little industrial shelving unit for our dining room. 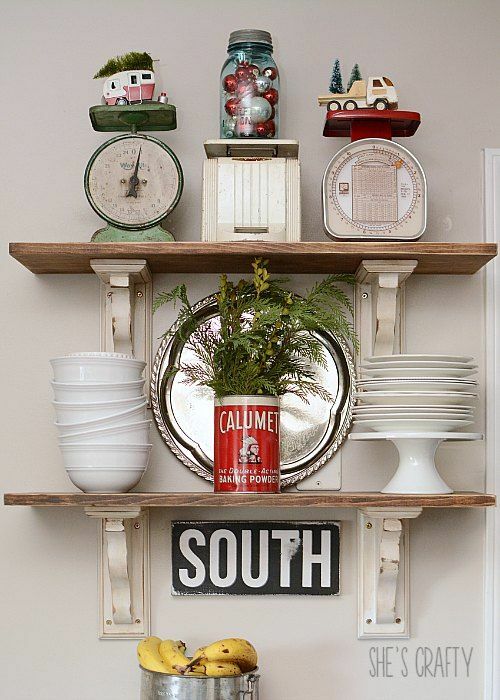 I've also used these shelves in the living room. Right before Thanksgiving I made the Gather sign out of a reclaimed piece of wood. I'll show the DIY instructions soon. 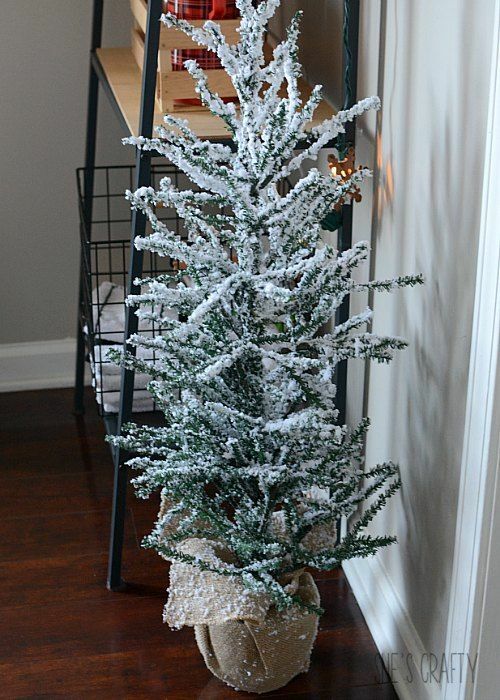 I picked up this darling flocked Christmas tree from Walmart. $12!! 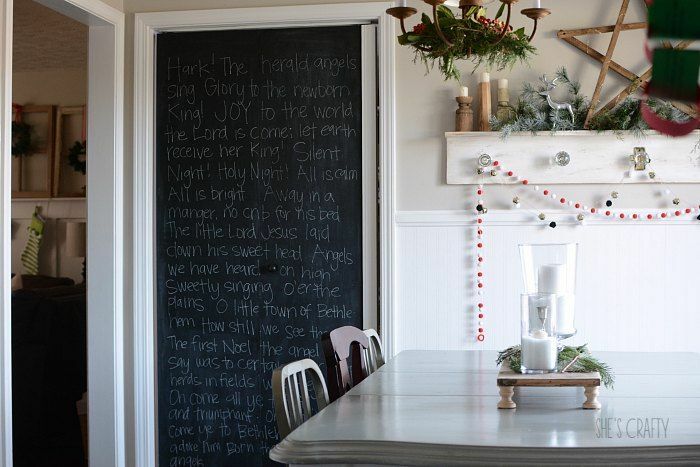 One of my favorite Christmas touches is our chalkboard doors. 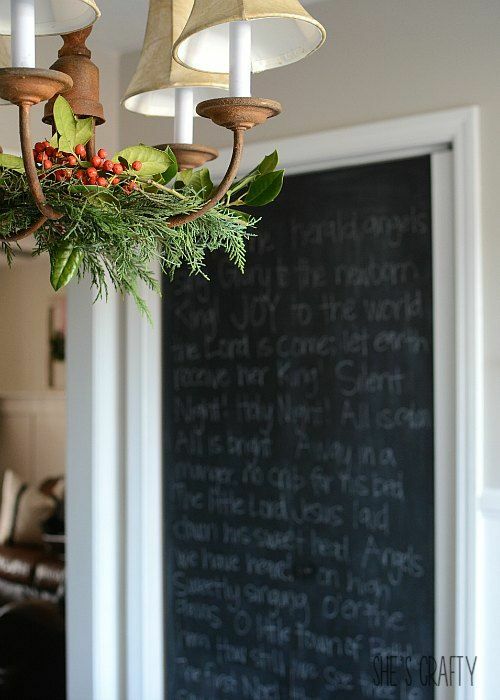 I wrote the lyrics to many Christmas hymns. I can't walk by without singing! 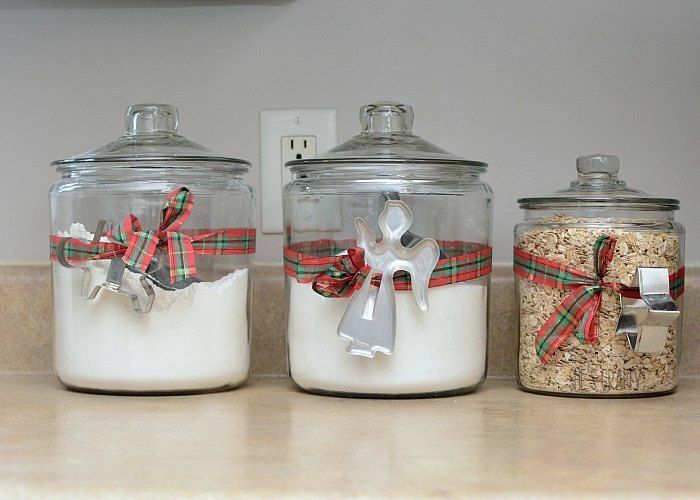 The kitchen got a few little Christmas touches too. 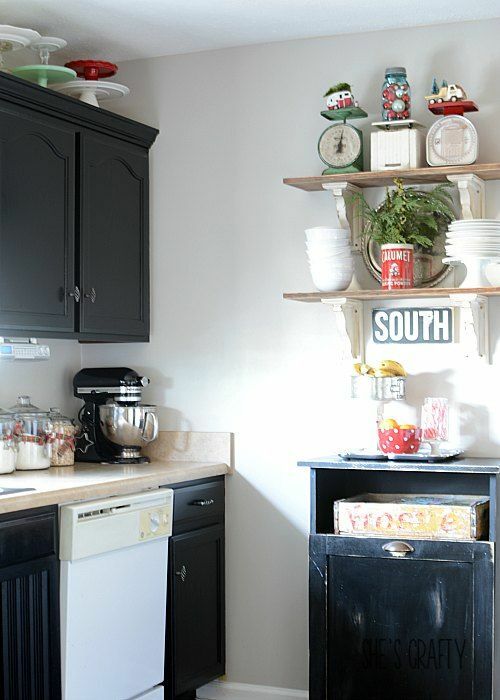 The open shelves in our kitchen were such a fun place to decorate! 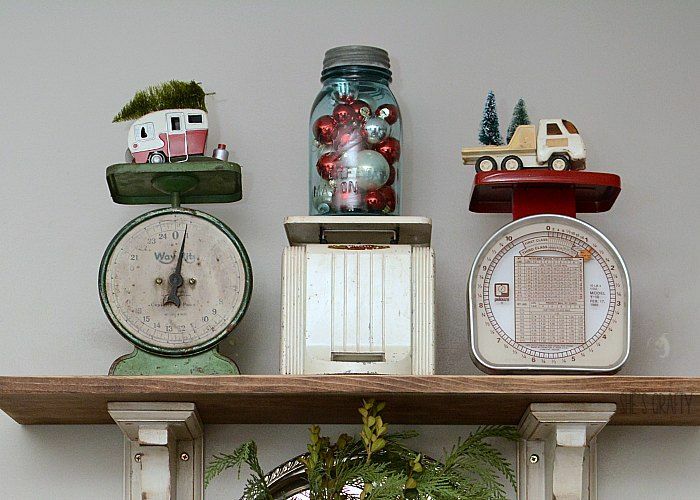 On top, I put a few of my vintage scales. with bottle brush trees in the back. 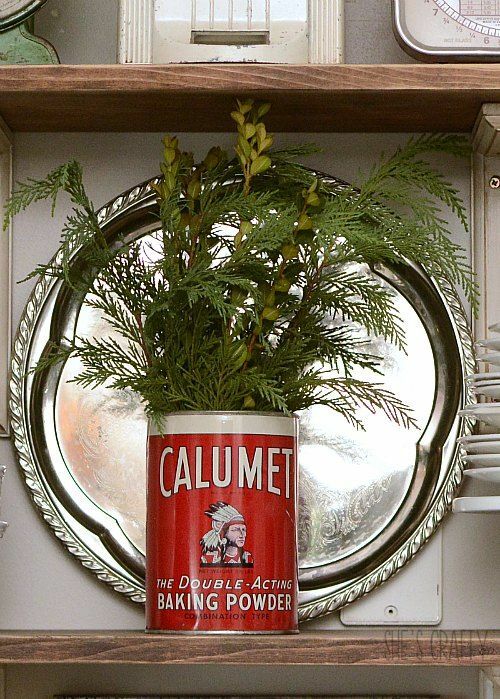 this vintage tin with fresh greenery. I love to bake! Especially during this season. vintage cookie cutters and Christmas ribbon. 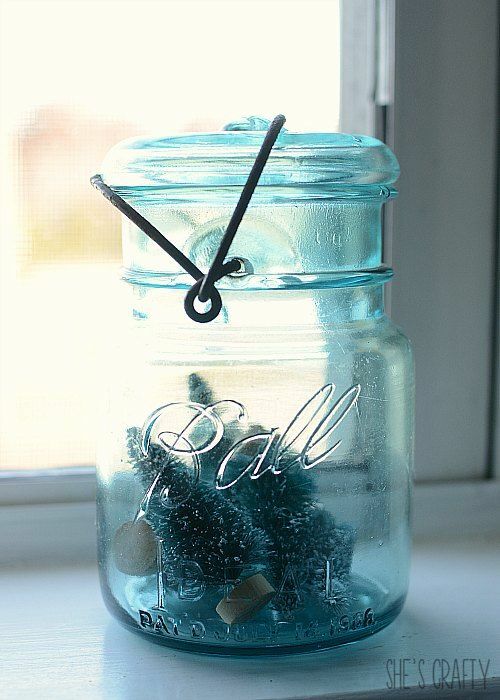 I love (obviously) filling jars with cute Christmas bits and baubles. 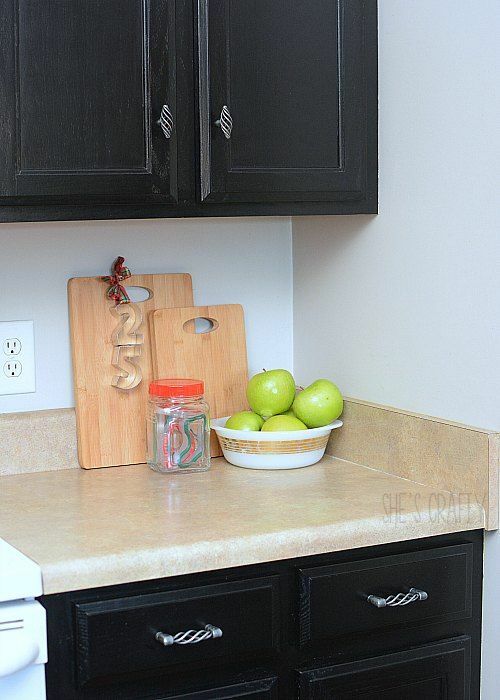 with cookie cutters and apples. 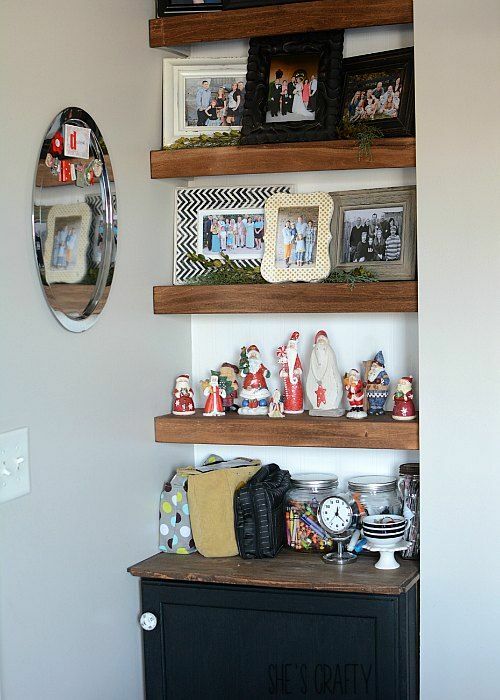 Another favorite spot to decorate is our built in shelves. 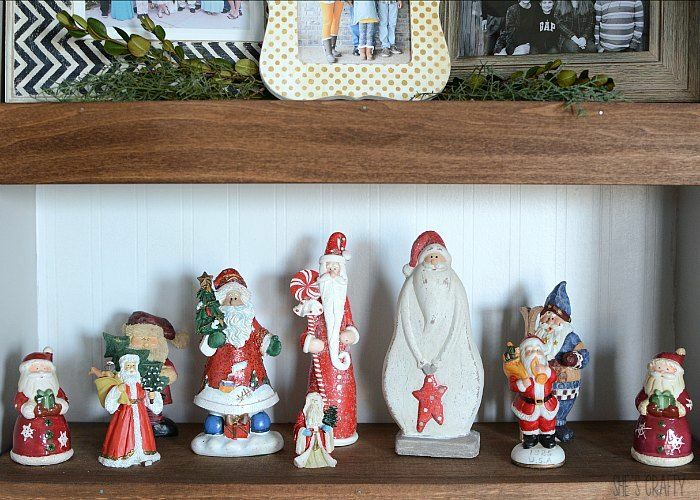 I displayed collection of Santa's on the shelves. 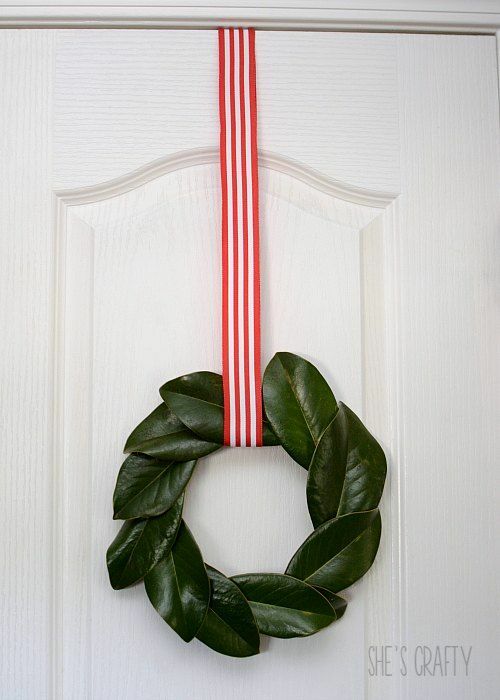 Last but not least is this magnolia wreath. I'll show a tutorial for this sometime soon. 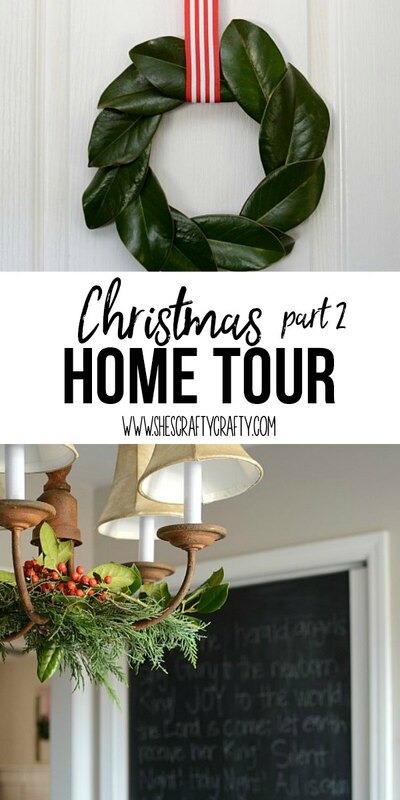 I hope you've enjoyed my Christmas Home Tour.